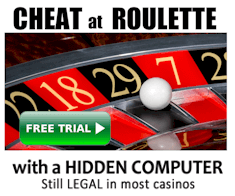 This seller (John) offers two primary methods to play roulette: a roulette computer device, and visual ballistics methods. I have spoken to the seller via phone a few times before, and know several people who have personally visited him. Initially I thought he was Mark Howe, but can now confirm Jafco is NOT Mark Howe. To a novice, his video demonstrations may appear impressive. To an experienced player, it is very clear that the wheel he uses is incredibly easy to beat as the ball has very predictable bounce, and the same diamonds are hit by the ball in a consistent way. This is not to say what he offers is without merit – simply that his videos should not be used as proof of anything for real casino conditions. Jafco visual ballistics (vibe): The material is very clear and well presented. It is clear that John takes care in explaining the concepts, and that he understands them himself. Certainly his methods are valid for some wheels, but unfortunately they are nothing new, and not realistically adequate for most modern wheels. This puts them in the same category as techniques from Pierre Basieux and Laurence Scott. Overall, Jafco offers clearer explanations that Laurence and Pierre so it is more suitable for beginners. But essentially if you compare methods between Pierre, Laurence and John, the techniques are much the same but presented in a different way. If you are choosing between Pierre, Laurence or Jafco, I suggest Jafco is the better option as his support is better, and his material much clearer and easier to understand. Jafco Pred7 roulette computer: This is a roulette computer device operated on a PDA / handheld computer. I have seen what I was told was his device, but cannot confirm this. I have also obtained information from players who have his Pred7 device. Based on this, it is a reasonable device with some well thought out features. 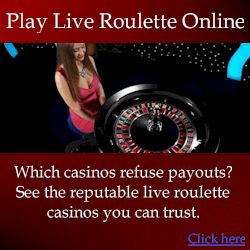 But at its core, it is still only a very basic roulette computer that is realistically incapable of achieving accuracy on modern wheels. The Pred7 device is comparable to my Lite Roulette Computer (see comparison chart). Another roulette computer seller (Forester / Miro Zirdum) has at times attacked John and the Pred7 roulette computer, but the reality it that Pred7 is substantially better than at least Forester’s early roulette computers. It must be understood that Forester is an incredibly arrogant man with the attitude that if he didn’t make it or think of it, then it is a scam. Being a roulette computer developer myself, I have seen first-hand how dishonest and manipulative Forester is to boost his business. Nevertheless, both Forester’s and Jafco’s computers have similarities, and for one element, they have a different approach, each with its own set of advantages and disadvantages. When comparing Forester’s latest computers (FFA) to Jafco’s Pred7 computer, on some wheels, FFA is more accurate, and on others Pred7 is because of the different approaches to wheel conditions. While it may be considered promotion of my own devices, the reality is where both Pred7 and Forester’s computers fail, mine succeed. But when comparing just Forester’s FFA and Jafco’s Pred7 computers, ultimately Pred7 is more accurate on a broader range of wheels, although Forester’s FFA and other devices are better value for money. Do not believe Forester’s misleading propaganda about how PDA (and mobile phones) can never take timings as accurate as microprocessors. What Forester says is true, but irrelevant because the difference in timing accuracy between PDAs/mobile phones and microprocessors is very small and INSIGNIFICANT. UPDATE 12 Sep 2011: John and I have communicated quite a bit over the years, and we have a relatively good understanding of each other. Despite us being competitors, I trust him to be an honest person. While I sincerely believe my products to be superior, it is up to the purchasers to decide which product is right for them.